Jeep 07-14 JK Wrangler Round Front Turn Signal Lenses with Amber L.E.D. 's Located Under Front Headlights - Smoked Lens, the premiere manufacturer of aftermarket lighting and accessories for the Truck, Jeep, and SUV market is proud to announce their new CLEAR & SMOKED LED SIDE & FRONT FENDER LENSES w AMBER LEDs for 2007-2014 Jeep Wrangler's. CLEAR & SMOKED LENSES replace the factory amber lenses that are installed as original equipment on 07-14 Jeep Wranglers. 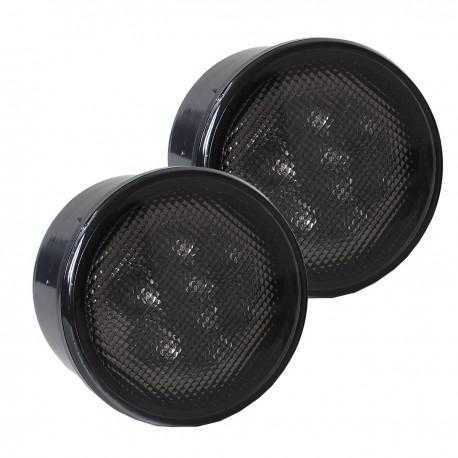 CLEAR & SMOKED LED LENSES function as AMBER LED running/parking lights & AMBER LED turn signals. Each kit includes 2 LED lenses (1 per side). CLEAR & SMOKED LED LENSES are a direct plug-n-play O.E.M. replacement for the factory installed amber lenses that come as standard equipment on your Jeep Wrangler. CLEAR & SMOKED LENSES w AMBER LEDs take just minutes to install and add that “tough no-nonsense” look to your 07-14 Jeep Wrangler. CLEAR & SMOKED LENSES are made to exacting standards which exceed O.E.M. specifications. CLEAR & SMOKED LED LENS kits are street legal and have been approved for use by the National Highway Traffic Safety Administration “(NHSTA”). Each CLEAR & SMOKED LED LENS kit comes complete with either clear or smoked lenses and uses super-bright AMBER colored LED lights for running/parking light & turn signal illumination. COMBO LED KIT IV: SET Faruri LED + Proiectoare Ceata LED + Stopuri LED + al 3-lea Stop Frana LED + Semnalizari Laterale si Frontale LED, JM Evolution NEGRE pt. 07-18 Jeep Wrangler & Wrangler Unlimited JK - 20% DISCOUNT !! !